Indonesia is rich in a variety of wonderful local art, including various traditional musical instruments with a particular sound. 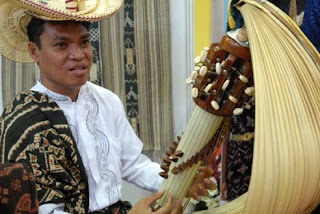 One instrument that must be considered to be maintained is a stringed instrument from Rote Island, East Nusa Tenggara named Sasando, musical instrument that is found since the 15th century. 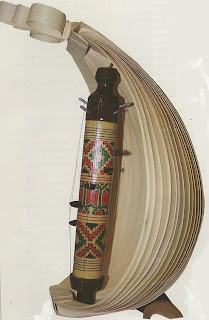 Sasando is a stringed musical instrument. Sasando the same form with other stringed instruments such as guitar, violin, and harp. But its uniqueness is the main part of a long tube-shaped lute Sasando as usually made of bamboo. Sasando media sound reflector made of tree leaves gebang (a type of palm tree that grows on the island of Timor and Rote Island) is a talent to be a half circle. Sasando tubular length which is usually made of bamboo. Then in the middle, a circle from top to bottom are the lumps, where the string (string) stretched across the pipe from top to bottom rests. Wedge wedge gives a different tone on every string section. Then Sasando tube is placed in a container made from a kind of woven palm leaves like a fan made. This container is where the resonance Sasando. Sasando very unique sound when compared with the guitar, usually Sasando more varied. This is because Sasando has 28 strings. That's why the play is not easy because a player Sasando Sasando must be able to create rhythm and feel the right tone of all the existing strings. Sasando with 28 strings called Sasando ankle, while the type of double Sasando has 56 strings, and some has 84 strings. How to play the Sasando is to be taken such as playing guitar. But Sasando not have a chord (key) and the string must be plucked with both hands, so it is more like a harp. Until now almost all the materials used to make Sasando is original material, except the strings. In fact, many people are not many who can play this instrument. Parents are always proud to play Sasando for their children or in a traditional ceremony, complete with hat TiiLangga, clothing and traditional dances, so many have died. Meanwhile the younger generation are not much interested in knowing a little more than learning to play.